You've probably already seen Sofia Coppola's divine collaboration with Louis Vuitton; the SC bag is just too gorgeous to resist! I particularly adore the ecru-the classic shape and decidedly feminine color are perfect! Are you swooning for this logo-less Vuitton, or are you dreaming of another delicious bag? ah this bag is beautiful, classic and chic! i had not heard of this new collaboration, thanks for sharing. i'm currently lusting after a chloe bag but this one is amazing as well! not sure about me and a white bag (only spells disaster) but this is so utterly chic! The campaign with her is gorgeous too! 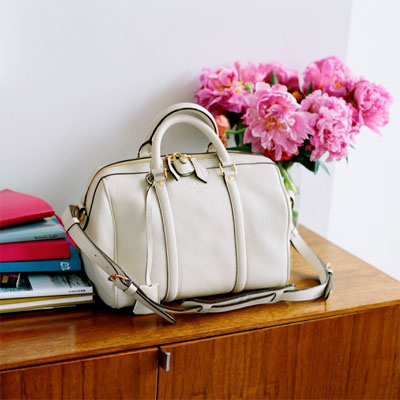 I simply adore this no-logo Lv bag by Sofia Coppola!! This is one of my next target...(with a Chanel bag, too..), but my sweetheart doesn't know it!!! Pikabooooooo! I am lusting after this bag! I love the black and gold accents..perfect! Swoon swoon swooning.... Gah - sooo pretty and I think Sofia Coppola is divine! are you kidding me???? i need that bag!! ooh, that is a beautiful bag! love it! I've always wanted a white bag. Very beautiful and sans LV's ... Brilliant! Be still my heart!! That bag is STUNNING. wow what a gorgeous bag!! I love it! Sofia Coppola can do no wrong in my book ~ a class act! I have been lusting after this bag for quite awhile. Of course Sophia's great sense of style is involved!